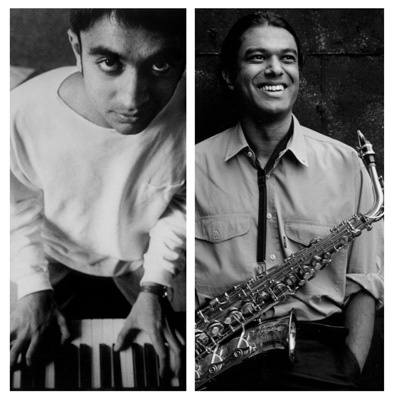 Pianist VIJAY IYER and alto saxophonist RUDRESH MAHANTHAPPA represent a new generation of American jazz musicians who explore the cultures of their ancestry through their music. The sons of immigrants from India, they draw from Asian, African, and European traditions to create original music that is beyond category. They have gained recognition from audiences, musicians, and critics alike as world-class improvisors and composers, outspoken young Asian American voices, and important forces in the music world. Since 1996, Iyer and Mahanthappa have worked together constantly, performing their cutting-edge original music to widespread acclaim around the world. To learn more about Vijay as a leader including recent reviews, recordings, and Mp3s, please visit www.vijay-iyer.com. Named a Rising Star of the alto saxophone by Downbeat International Critics Poll for the past 3 years, RUDRESH MAHANTHAPPA is one of the most innovative young musicians in jazz today. By incorporating the culture of his Indian ancestry, Rudresh has fused myriad influences to create a truly groundbreaking artistic vision. As a performer, he leads/co-leads five groups to critical acclaim. His most recent quartet recording Mother Tongue on Pi Recordings has been named one of Top Ten Jazz CDs of 2004 by the Chicago Tribune, All About Jazz, and Jazzmatazz to name a few and also received 4 stars in DOWNBEAT. This CD reached #8 on US jazz radio charts and remained at #1 on Canadian jazz radio charts for over a month. He has also worked as a sideman with such jazz luminaries as David Murray, Steve Coleman, Jack DeJohnette, Samir Chatterjee, Von Freeman, Tim Hagans, Fareed Haque, David Liebman, Greg Osby, and Dr. Lonnie Smith. As a composer, Rudresh has received commission grants from the Rockefeller Foundation MAP Fund, American Composers Forum, and the New York State Council on the Arts to develop new work. Mahanthappa has his Bachelors of Music Degree in jazz performance from Berklee College of Music and his Masters of Music degree in jazz composition from Chicago's DePaul University. To learn more about Rudresh as a leader including recent reviews, recordings, and Mp3s, please visit www.rudreshm.com. RAW MATERIALS, their duo project, engages the listener with intelligent melodies and harmonies combined with wonderfully layered rhythms, epitomizing new jazz at its best. Their ongoing musical collaboration showcases their strong creative alliance, their common perspectives and contrasting dispositions. The duo has premiered an evening-length work commissioned by the Rockefeller Foundation, had a performance broadcast on Swiss Radio, and appeared at international festivals in Strasbourg, San Francisco, Seattle, Perth, Melbourne, Vancouver, the Hague and Montreal, among others.